Miss Pintados 2007 winner Miss Ma. Victoria Salazar of Sogod, Southern Leyte is flanked by newly elected Tacloban City mayor Alfred Romualdez and wife newly elected city councilor Cristina Gonzales-Romualdez. At far right is last year’s Miss Pintados winner Miss Sheina Marie Cubillo. TACLOBAN CITY, Leyte – With an almost fully-filled audience at the astrodome watching the prestigious annual regional beauty search in connection with the Tacloban City fiesta, candidate no. 3 Miss Ma. Victoria Salazar of Sogod, Southern Leyte bested 14 other candidates to capture the Miss Pintados 2007 title on Wednesday. A BS Nursing graduate at the Fellipe Verallo Foundation in Cebu City and a Miss Sogod Tourism 2003 winner, Miss Salazar is the daughter of the couple Victor Salazar, a municipal employee in Sogod, and Juanilita Cabaron of Tagbilaran City. Standing at 5’6” in height with a vital statistics of 32-22-33, the 22-year old Miss Pintados 2007 winner received a cash prize of P50,000, a P2,000 worth of gift packs plus a trophy, sash and bouquet. She also won the Best in Gown, Miss Professionalism, Darling of the Press, Miss New Placenta and Miss Smart awards. The 1st runner-up award was won by the 17-year old Miss Maricor Abenio, candidate no. 1, of Tacloban City who received a cash prize of P30,000 plus a trophy, sash and bouquet. Miss Abenio is a student at the Remedios Trinidad Romualdez Medical Foundation (RTRMF) taking up BS Nursing. Candidate no. 14 Miss Rosejane Tiunayan of Taft, Eastern Samar got the 2nd runner-up award with a cash prize of P20,000 plus a trophy, sash and bouquet. A BS Nursing student at the Remedios Trinidad Romualdez Medical Foundation (RTRMF), the 18-year old 5’5” in height Samar beauty also bags some of the minor and special awards as in Best in Swimsuit, Miss Samsung, Miss Panasonic, Miss Globe and Miss Husai awards. The 3rd runner-up was captured by candidate no. 13 Miss Migzy Lou Arian Quinto of Tacloban City who received a cash prize of P10,000 plus a trophy, sash and bouquet. Miss Quinto is a BS Accountancy graduate at the Eastern Visayas State University (EVSU). Miss Kristina Asuncion of Tacloban City, candidate no. 9, got the 4th runner-up award and received a cash prize of P5,000 plus a trophy, sash and bouquet. A BSIT student at the Eastern Visayas State University (EVSU), Miss Asuncion also won two minor awards as in Miss Photogenic and Miss Gatorade. Other minor award goes to candidate no. 4 Miss Vanessa Oplegida of Carigara, Leyte for Miss Congeniality and candidate no. 8 Miss Dianne Blanche Cancino of Tacloban City for Miss Popular Candidate which, as a prize, entitled her for a 20% commission on ticket sales of the pageant. All the 15 official candidates received a gift certificate and a gift pack from Dettie Panis Salon. Hosted by Mr. Stephen Lagarde, the 4-hour beauty pageant started at about 9:00 in the evening with the opening rendition of an invocation and Philippine national anthem by the Kaliawan Dancers followed by a self-introduction number by the Miss Pintados candidates led by Miss Pintados 2006 winner Sheina Marie Cubillo. Judging the event were Anna Mariz Igpit of the Bb Pilipinas Charities Inc., Mayumi Lugod of the Perpetual Help College of Manila, Stephanie Crosby of the Volunteer for Visayans, Chelsea Shea of the Volunteer for Visayans, Mr. Gusty Uykim and GMA7 showbiz personality Ken Punzalan who also serenaded the Pintados beauties. The criteria for judging were based on the following: Physical Appeal – 30%, Communication Ability – 30%, Stage Presence – 25%, Professionalism – 10% and Popularity – 5%. Pintados beauty and PAL stewardees Miss Rhea Mangacat with Councilor Ernesto Dionisio from the City of Manila do most in the giving of the minor awards to the winners. There was however a slight setback in the show before the announcement of the 5 finalists, when candidate no. 15 suddenly collapsed at stage and immediately thereafter each candidate back off from stage even without the call from the pageant host which caused the audience to a big surprise. It was learned from the candidates and their talent scout at the back stage, that they [candidates] were all feeling tired and so weak because of the long period of stay on stage during the show coupled with several days of rigid activities and assignments. They also claimed that the candidates have skipped dinner before the start of the show. The pageant night on Wednesday marked the 20th staging of Miss Pintados beauty search. Showbiz personality now councilor-elect of Tacloban Cristina Gonzales-Romualdez together with husband mayor-elect Alfred Romualdez. Also in photo is councilor Tita Pedrosa (left) and PIA Director Olive Tiu (right). 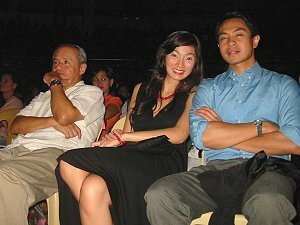 Pintados beauty and PAL stewardees Miss Rhea Mangacat with Manila City Councilor Ernesto Dionisio. At left is Tanauan, Leyte mayor Roque Tiu. 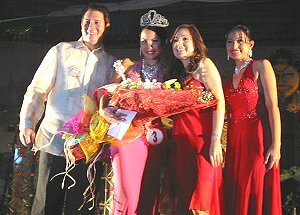 3rd runner-up winner Miss Migzy Lou Arian Quinto of Tacloban City with presentors PIA Director Olive Tiu and Tanauan, Leyte mayor Roque Tiu. The Finalists with couple Alfred Romuladez and Cristina Gonzales-Romualdez.